During my trip to Georgia I had enough time to finish two books. 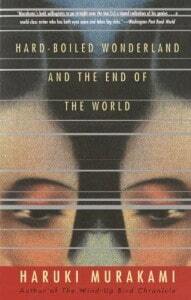 One was Haruki Murakami‘s Hard-boiled Wonderland and the End of the World. A phantastic story jumping between two different worlds – one set in more or less nowadays Tokyo where a fight between an information protection agency (the System) and its Calcutecs, and the information stealing Factory with its Semiotics – the other world set in a town surrounded by an impenetrable wall, where a newcomer reads dreams from skulls. Both worlds carry similar characters, and as the story progresses and the world are converging to each other, we see that they are actually only one world and one set of characters. The two worlds cannot be more different as it seems, one, the “Hard-boiled Wonderland” where we find ourselves in a turmoil of the fight between Calcutecs and Semiotics, a strange professor doing sound research, disgusting creatures called INKlings living in and below the metro in Tokyo. The other world, “End of the World”, a peaceful living without excitement, sorrows, disappointments, but also without joy, where everyone does his work, is content with his position. As the story develops we see that the worlds are related, or created, or even “are”, our conscious and unconscious mind, questioning identity and personality.